On a Monday morning, February 21, 1910 Charles A Taylor, a farmer who lived just east of Rays Mill, GA , took a train trip on the Georgia & Florida Railroad. Shortly before 10:00 am that morning, he boarded the train headed for Valdosta. But just a few miles down the track, as the train approached the station at Bemiss, about ten miles south of Ray City, there was a head-on collision. 1909 Train wreck on the Georgia and Florida Railroad at Bemiss, GA about ten miles south of Ray City. Passenger train No. 3. southbound, and a northbound freight train on the Georgia & Florida Railroad, had a head-on collision at Bemiss, eight miles north of Valdosta this morning about 10 o’clock. The cause of the collision has not yet been fully ascertained. One report says that the freight train instead of pulling into the south end of the side-track at Bemiss, ran on to the north end, preparatory to backing onto the siding, when it was struck by the passenger train which was slowing up for the station. Another report is that the brakes on the freight train refused to work and the engineer was not able to control his train. 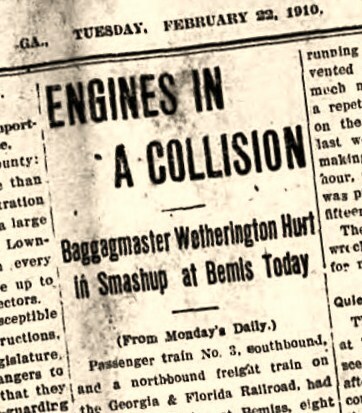 Mr. C. S. Wetherington, baggage-master, of this city, was the only person seriously hurt in the collision, though a number of passengers were badly shaken up and one of them had some slight cuts on his face. The full extent of Mr. Wetherington’s injuries had not been learned when The Times went to press, but unless he is hurt internally it is not believed that they are very serious. Mr. Wetherington is a son-in-law of Elder A. V. Simms, of Valdosta. Mrs. Lankford, wife of Judge Lankford, of the county court of Douglas, was slightly bruised and Mr. C. A. Taylor, of Rays Mill, had his lip cut. Neither of these parties are seriously injured, however. Dr. J. B. S. Holmes, the road’s surgeon, was telephoned to immediately after the wreck and he went to the scene in an automobile to minister to the injured. The baggagemaster was brought to the city in an automobile, and is now at the Halycon, where he is receiving medical attention. It is said that both locomotives were practically demolished, the passenger locomotive plowing its way almost half through the other. The passenger cars were not greatly damaged. The fact that both trains were running very slowly is all that prevented the collision from being a much more dangerous one – possibly a repetition of the disastrous wreck on the Georgia Southern & Florida last week. The freight train was making only eight or ten miles an hour, at the time and the passenger was probably not running faster than fifteen or eighteen miles an hour. The track was blocked by the wreck and all trains were delayed for many hours. Born in 1870, Charles A. Taylor was a son of William Henry Taylor (1849 – 1918) and Amanda F. Parrish (1850 – 1930). He lived and farmed all of his life near Ray City, GA. Charlie Taylor died in 1927 and was buried at New Ramah Cemetery at Ray City.